"So what's the news on the island Jimmy?" "Oh nothing much happening, Fred. It's a slow time you know." I was sitting on a crumbling sea wall alongside James Rolle, my best friend on Bimini, staring out at the reef and the blue ocean beyond. There was a cool breeze coming off the Gulf Stream that felt like the essence of renewal. I breathed it in. This tiny watery place puts me back in touch with a part of my being that gets covered over in New York City by ambition, obligations, sadness, wanting. I have been coming here since I was a kid. I'd been away for a year. I noticed an expensive looking speedboat sitting a hundred yards up the beach. It looked brand new as if carefully lowered onto some jagged rocks by a crane. "What's with the boat, Jim?" He shrugged. "She was owned by couple of Russian doctors. " Jimmy is very smart. He might have been a surgeon or a philosopher or a novelist, but he grew up on this island where Ernest Hemingway wrote novels and fished for marlin during an era when there were still many big fish hunting in the sea. Jimmy became a fisherman and a builder. When he was a young man, before we became close friends, I watched him idle the seven-mile length of Bimini on a big motorcycle like a benevolent king watching over his domain of sand, mangroves and Australian Pines, some shacks on the hill, a school of small tuna splashing in the distance. Now at seventy Jim mainly sits around and observes and remembers. He has had real bad turns - Jim has lost two children and he is broke - but he is not a man to be burdened by regret. "That's a beautiful boat. What's it doing on the rocks?" "The doctors crashed it, Fred." This tiny island plays deep tricks with time. The world rolls on and Bimini remains unchanged. Except if you look closely. Then you might see unusual things. I speak to six or eight old timers I have known for a half century who are gathered on the Game Club dock with its view of bonefish flats and mangroves spreading to the south and east. Most mornings these men talk fishing and politics. Among them is the great marlin captain Bob Smith, a brash man, and also Don, the dock master at the club. What a terrific smile Don has--it lights my day. When I think back on this gathering of friends, these two were surely among the group, although Don died seven years ago in a terrible seaplane crash and Bob caught a blue marlin just two days before the massive heart attack that took him. Who knows why the living and dead walk hand and hand on the island? Perhaps it is the vagrant currents of the Gulf Stream that spawn mystical happenings, as some claim. Or maybe it is only the heady sea air that breeds an acute nostalgia. When I mention such sightings to Jimmy he nods without surprise. Jim is a large silver- haired man with a warm engaging manner. He has seen a lot and seems to know more than he says. His being reflects a Buddhist mentality--all things are possible, and nothing matters so much. Fred, you need to be tranquil to see what there is to see Jim says without saying it. I try to be calm when I'm around him, to listen and feel, but it's hard because I'm a New York guy. "But why'd the Russians crash their boat, Jim?" "They were being chased by the Coast Guard, Fred." "Well, I don't know for sure but fellas say the doctors were smuggling body parts." "You mean like livers and kidneys, for big money." Bimini, sitting a mere fifty miles off the Florida Coast, has led a charming renegade life. In the 19th century a few dozen former slaves, who had had enough of tilling the land, made their living as "wreckers". They built towers on the shore, right where Jim and I were sitting, so they could spot ships that were in trouble or that had foundered on the shallow reefs to the north and south. Then they would sail out and negotiate with the sailors to pull a boat off the reef and to salvage the supplies for a fee. But when business was slow, as it often was, the wreckers lit fires and torches on the shore as though they were marking the channel into Bimini Harbor, but actually they were trying to lure mariners out of the deep water onto the reef. Then when a small freight boat sunk, Biminites--pirates really-- boarded the craft and took the supplies. In the twenties, locals established large warehouse barges to supply Florida with alcohol during prohibition. Everyday rum running speedboats crossed the Gulf Stream from Florida to load up on liquor and raced back to the mainland chased by the Coast Guard. In the seventies and early eighties the island became a transshipment point for drugs coming from Colombia to the States. Colombians smuggled marijuana and cocaine onto the island and local guys ran the drugs in their fast boats into Florida. Some of the bonefish and marlin guides became wealthy smuggling dope and they built opulent island homes, bought private planes and yachts and gaudy jewelry; but the island fosters an easy come easy go mentality and soon after the DEA shut down the trade, everyone was broke again.
" Jimmy, you think Bimini smuggling days are finished?" "No, no, no Fred. Marijuana smuggling days are finished. But Florida's just over the hill," he said pointing west. "There always be smuggling." "Like the Russian doctors smuggling body parts?" "Well, not so much body parts." He answered. "These days it's more smuggling Chinese people." "Where do they come from Jimmy? "Well, I don't know that Fred," he said chuckling. "China, I suppose. Groups of them get here from Nassau looking to go to the States and start a new life." A new life. The solemnity of this made it feel ridiculous to keep asking questions. But then I couldn't contain myself. "How do the Chinese people know where to go when they come here, Jim? They must feel so out of place." "They just know. It's like, say you were a crack head and you needed drugs. A crack head knows what door to knock on to get what he needs. I don't know what house up the road sells crack but he knows." "It's the same with the Chinese? They just know what door to knock on?" " It costs $5000 for each passenger. Usually a boat carries ten or twelve men." "That's good money, $50,000 for a few hours work." "Not really, you know. It's too dangerous to come into a marina with a boatload of Chinese people. Usually a fellow will crash his boat onto the beach in Miami and then run away from it ahead of the police. Then he's got to buy another boat. " "Jim, after they crash on the beach where do the Chinese people go? They can't just wander around South Beach." "I don't know that Fred. But they know. " "You mean like the crack heads know?" 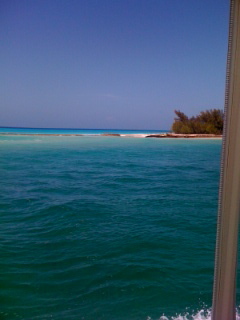 Two days later, I was walking along the dock at the Bimini Big Game Club, where I was staying with my family. A north wind was blowing about twenty. It was a rough day in the Gulf Stream--not the best for fishing. A few of the fellas were gathered around a Cuban guy wearing wet clothes. He'd just been put on the dock by a couple in an open fishing boat. He seemed like a humble man, grateful to be alive though there was something in his expression I couldn't pin down, perhaps sympathy or contrition. Let's call him Carlos. Here is the story Carlos told us on the dock: The previous night he'd been fishing for grouper to the north of Bimini, when suddenly the transom fell off the back of his open fishing boat. The boat went down in a half minute and Carlos was in the water holding onto a cooler. He floated in the darkness for many hours. He almost surely would have perished except that in the late morning a small fishing boat came by and spotted him in five foot breaking seas north of Great Isaacs Light. Someone asked Carlos if he had been afraid of sharks in the night and he said he hadn't thought about them. He just focused on holding the cooler and staying alive. But Carlos had drifted through an area rife with big sharks and could easily have been torn apart. I asked him how he felt about this miracle second chance. He smiled softly and drank his soup. I felt a little disappointed, as if an event like this should yield a grand epiphany. What were the chances of surviving the night holding a small cooler in big seas and then being discovered in a vast expanse of ocean by a small boat that shouldn't have been out on such a rough day? The following morning I was back with Jimmy, sitting on the sea wall. I glanced at the speedboat perched on the rocks. I was taking stock, trying to store impressions and lessons. The following morning I'd leave the island, go back to New York. A few days later the sights and smells of the island would start to become less distinct. I hate that. Each time I come I vow I will hold onto the feelings of this place. I vow I'll keep in touch with Jimmy. I'll be a better friend. "Oh, nothing much happening, Fred." I asked Jim if he'd heard about the Cuban guy who drifted through the night and had been saved off the Great Isaac's light. He nodded, yes. Jim's manner is always understated. Murders, miraculous survival stories at sea--such things Jim takes in stride. Of course a seaman in the islands, like my friend, witnesses many remarkable things in a long life. "What do you think man?" "I think a transom doesn't just fall off a fishing boat in the middle of the night, Fred." "What do you think happened out there, Jim?" "Well I don't know, but I'd bet he was smuggling some Chinese or Haitians to Miami, the boat hit something and she went down. Accidents like this happen in the Gulf Stream at night." "And what about all the passengers." "If I'm right, they drown. Chinese guys don't know anything about going in small boats or surviving in the open ocean. Carlos is a seaman, he'd have a chance. The others, they'd just drown. That's my guess." "And we'll never know if you are right or wrong?" "We'll never know unless the bodies or parts of the bodies wash up on the beach." For Jimmy the story was a part of the seascape of life--it just fit in, like a small shark we noticed fining out along the edge of the sand bottom where it came up against the darkening reef. Smuggling Chinese and Haitians would continue. Why not? Almost anything is possible and it's not so important as it might seem.